Shoulder, Abdomen, Chest, Hip and Back. 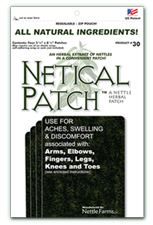 This patch is applied to the appropriate area to help eliminate aches, swelling and discomfort. The Netical Patch™ may be applied to your shirt or blouse above the area of discomfort (for use by those who are allergic to adhesives, apply directly to the skin). Each order includes: Four - 4" x 6" patches with adhesive backing. Only $23.95 + $2.50 S/H • Any Additional Package Only $19! Arms, Fingers, Legs, Knees and Toes. 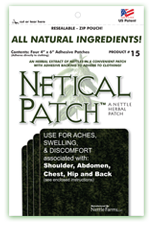 This patch is applied to the appropriate area to help eliminate aches, swelling and discomfort. The Netical Patch™ may be applied directly to the skin which can be positioned with an elastic-wrap, self-adhering wrap or sock. Each order includes: Four - 5-1/2" x 8-1/2" patches. Muscles, Tendons, Heels, Headaches and Sore Throat. Each order includes: Four - 3" x 11" patches. *Results may vary with individual user and type of ache, swelling and discomfort. *These statements have not been approved by the FDA. This product is not intended to cure, treat or prevent disease.